Win a £25 voucher in our Susu the cat competition! To celebrate our beloved pet cat, Susu, we’re launching a brand new cat-themed compawtition to give you the chance to win £25 worth of SUSU vouchers. Susu has been living around the Union since 2002 when, as a stray cat, porters started to give her food. Now a permanent resident, she can often be found in her bed on level 4 of the Union. Last year she was even the mascot for the team from University of Southampton on University Challenge. So what better way to revere our cherished moggy than by holding a competition in her honour?! In order to enter the competition, we want you to get creative! 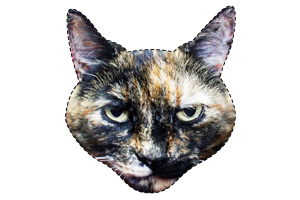 Print off a copy of the Susu the cat mask from the link below and snap a photo of someone wearing it, it really is that simple. Pawhaps you’re going somewhere exciting this summer? Have a funny idea of something SUSU the cat should do? We want you to be as imaginative and original as possible. If you don’t have a printer, you can pick up a mask from the CMT office above The Stag’s Head during working hours, Monday to Friday. To enter, all you need to do is upload your photo to Instagram using the hashtag #SUSUCatComp, tagging the Union’s official Instagram page @sususnaps. Don’t furrget, entries close on 1 August, with a winner being announced shortly afterwards. T&Cs apply.